Cold Cathode Fluorescent Lamp (CCFL) continues to grow as light sources for LCD backlights and the demand for higher brightness, longer life, longer length and higher quality continues to rise. At the same time, it is important to measure voltage and current of CCFLs more stably and with higher accuracy during the electric determination that determines the performance of the CCFLs. 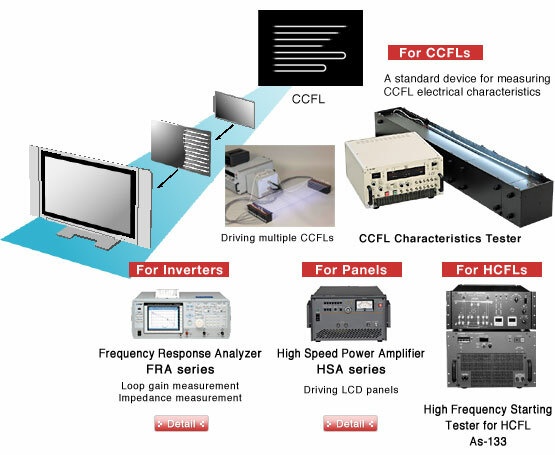 The NF As-100 Series CCFL Characteristics Testers are thus designed and built to test the electrical characteristics of the CCFLs used in the LCD and LCD TV backlights. 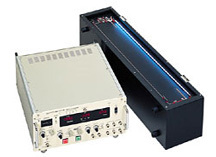 The system consists of a main unit (includes the power supply section that drives the CCFL and a measurement section which contains a voltammeter) and a test bench. You can choose from three models available, according to the type of your CCFL. 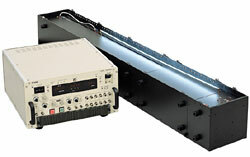 Every model makes use of precise power supply technologies and measurement technologies that the NF Corporation has accumulated over the years, allowing you to perform excellent and stable tests and measurements with high accuracy and high reproducibility.